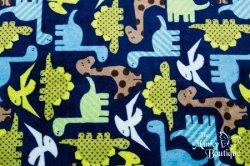 This extremely, soft and cuddly fabric has a silky smooth minky surface with an adorable Dinosaur print by Ann Kelle and is 58-60 inches wide. 100% polyester, machine washable and dryable. This fabric is as durable as it is soft! Wash after wash, this fabric holds up and stays looking as soft and fresh as the first day you used it.